Consuming at least 7 fruits and veggies a day can increase your energy level! 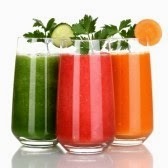 Juicing is even better, as it goes directly into the the bloodstream. Juicing helps you consume more fruits and veggies at one time, giving you more minerals and vitamins in one shot!